Linda had a great experience on her first ever dive with Tania, Matt and Tom. Congratulations to the PADI instructors who won the first PADI Europe, Middle East and Africa Elite Instructor My PADI Challenge! We are particularly proud of our own Kim (Alice) who, with another 14 PADI Professionals, certified more people between July and October than they did during the same four-month period last year. It is an amazing achievements, when considering there are 1,000’s of PADI Pro’s in the EMEA region. Kim was also the highest placed female in the group and she hopes this will encourage more females into the professional world of diving Instructors. The full list of winners can be seen below. My spouse and I did the open water dive certificate with Tenerife Diving Academy and was so glad we did. We both recommend them if this is your first experience.Our guide explained everything very clearly, even under water! The whole Team was great and very helpful with preparations for dives. They are all very friendly and funny. We are glad to have experienced our first dive with them! I booked a training session for my son so he could get good experience with his first dive. He was feeling scared and insecure from the beginning though he is a good swimmer. As a scuba diving instructor myself, it was important to see that they place a strong focus on the safety, comfort and enjoyment of their divers. In addition, the staff have a very positive and client-centred attitude, and they don’t compromise on quality. I would highly recommend diving with them! I did the DSD at the Tenerife Diving Academy and it was the best experience I’ve ever had, so I decide to do 3 more dives after the first one. Everyone where totally friendly and I always felt save while diving with Veronica. I’m looking forward to come back as soon as possible to do the Open Water Dive and maybe I’ll get to do the DM Internship too. Diving with the Tenerife Academy team was a fantastic experience. They are truly passionate about giving their divers a great time and providing excellent service. They made me feel at home and part of the family! I did the DSD at the Tenerife Diving Academy and it was the best experience I’ve ever had, so I decide to do 3 more dives after the first one. Everyone where totally friendly and I always felt save while diving with Veronica. I’m looking forward to come back as soon as possible to do the Open Water Dive and maybe I’ll get to do the DM Internship too. As an experienced diver I visited many dive centers in all the world, but only in this one i felt like I was in my home. Very friendly staff,nice diving spots, good equipment and safe diving by the most experienced divers in the island. Had my Divemaster certification over 6 weeks and had a great time. Very knowledgeable dive staff and great diving equipment and now i really feel ready for work. I did my first diving at the Tenerife Diving Academy with Veronica and Scott. 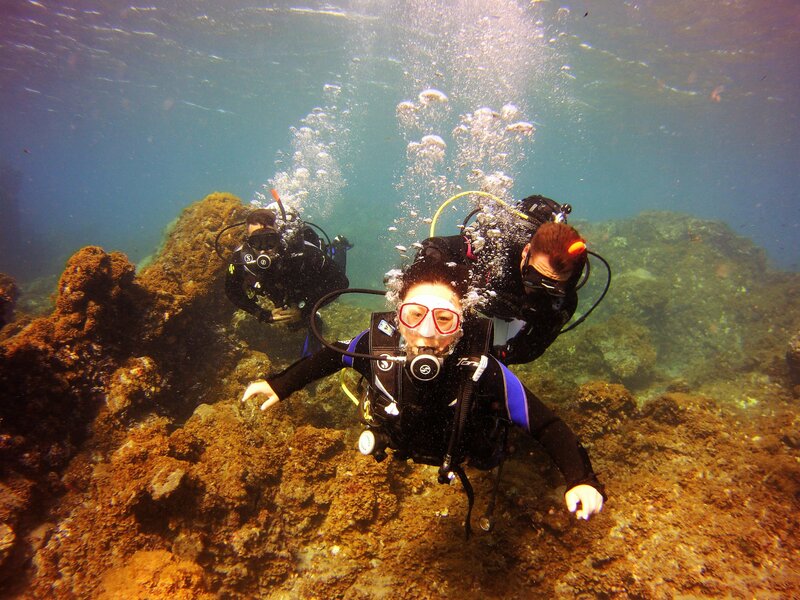 It was so great and beautiful that I did a second diving with Veronica. If you want to do your diving with someone who loves what she works for, you’ll have to ask for Veronica. Thank you very much for those great and wonderfull experiences! I’m sure, I’ll come back soon to do the Open Water Diver. Last but not least this Academy is really clean and nice! As an intern at PADI Divemaster Internship , you truly have some once in a lifetime experiences. I still have to remind myself that it wasn’t all a dream, it was in fact reality! No better place to do your professional training. Started as an Advanced diver completed my Divemaster and then went on to the PADI Instructor. Simply awesome. It is hard work and some can keep up but worth it if you put the effort in. When I finished my PADI IDC I knew I wanted to continue to train and gain experience. I didn’t want to train just anywhere…I wanted solid training from a professional dive organization. I found Tenerife Diving Academy on the internet and sent them an inquiry. The responses I received were informative, polite and timely. I made my decision…I was going to Tenerife! Upon arrival I knew I had made the right decision. The facilities were clean and organized. Staff was friendly and welcoming. By the end of my stay (six weeks) I had gained experience through instructing students, honed my skills and made some great friends. I left Tenerife Diving Academy as a confident MSDT ready for any future challenge in the diving industry. To those in search of professional training in a great environment…look no further! Big “thanks” to Pete and staff! Tenerife diving academy, is a great place to learn to dive whether that be as an beginner or a experienced diver. The center is situated in a marine protected area so there is so much life under the sea. When I was there I entered as a Rescue diver, I went there to achieve the qualification as a Divemaster, through all the hard work from Pete, Alice, Dave, Adam and the rest of the interns I achieved the qualification. After the Divemaster qualification I wanted to go for the Instructor, again with all the help with the dive center and the friends that I have made when I was there to achieve that level in the scuba diving world. So i say thank you so much for what you have done. In the dive center everyone is involved, looking after the customers, preparing for dives, working on there qualifications, helping around the center. The atmosphere of the center is great, meaning you enter with a smile on your face and when you leave you gain a bigger smile, friends for life, qualification that you can use or improve and a passion in the sport. The dive center is in a beautiful area, with many dives locations just in 400 meters of the center. Everyone that goes to the diving center is welcome with the big smiles, open arms and passion of diving of everyone that is there whether they be interns or customers. Tenerife diving academy is a great place to learn and to enjoy the diving in the areas around the island, the marine life is something that is magical and it is something that I would like to go back to. So to finish it off I will say this, Tenerife dive academy is beautiful place to go to learn to dive and have fun, making friends that will dive with you. This is a place that I would recommend to people that want to dive, like the warm sea, like to see massive amounts of marine life, gain qualifications, make friends, have fun and to have an experience of a life time. What an awesome experience. These guys make you feel comfortable and part of a team from the moment you arrive. I had the chance to do my divemaster internship anywhere in the world. I chose the right place. I would fully recommend Tenerife diving academy if you’re serious about a career in scuba diving. Great diving school with a perfect location to learn diving. We had some problems but they were taken care off properly!